Tiny Alwinton is the last village in Coquetdale and the ideal base for any number of interesting walks of various lengths. It stands on the route of Clennell Street an ancient cross-border track which eventually leads to Cocklawfoot on Scottish turf. As you kick start your walk along this time-served track you will follow in the footsteps of all manner of folk who have passed this way since time immemorial. However, you will quickly leave this firm track behind as you head to the east of the delightful River Alwin on a lonely circular route across spacious grasslands rising towards the windswept top of Wether Cairn. Along the way, you will cross The Dodd and Puncherton Hill with fine views towards the vast Kidland Forest now in the process of extensive harvesting. From here you will begin your long and sometimes boggy descent, first to Gills Law followed, in fairly quick succession, by Loundon, Silverton and Clennell Hills where you will enjoy dizzying views to the slithering River Alwin. Your downhill journey nears its conclusion as you clamber to the flat top of Camp Knowe, a fine example of an ancient hillfort. Once back in the valley, it is just a simple question of switching to auto pilot as you retrace your outward boot steps back to the comfort of cosy Alwinton. The hills may be small but make no mistake about it this is a tough wee walk. It is, however, none the worse for that. 1. 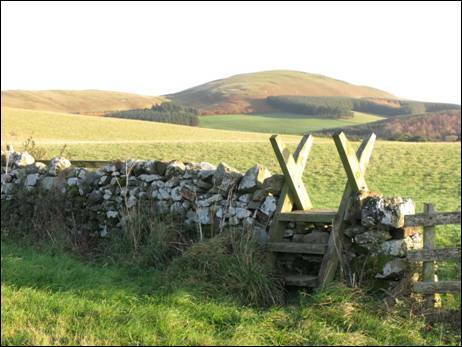 When describing the land to the north of Alwinton in his 1835 book, `Rambles in Northumberland and on the Scottish Border`, Stephen Oliver said that, the whole tract consists of hills and hopes, and craigs and cleughs, and that, the hills, which are conical, rounded at top, and covered with herbage to their summits, indent with each other in such a manner as to form alternately curving dales, through which many a wimpling burnie threads its way to the Coquet. Whilst much of the language used is now a tad outdated it is not too difficult to begin to obtain a clear picture of what to expect as you tramp across this part of the Cheviot Hills. Once you have parked your car in the Northumberland National Park Car Park (there is currently a small charge) (GR NT919063) and have sorted out the gear you will need for the day ahead, leave the parking area by turning left back through the tiny hamlet, passing as you go the Rose & Thistle public house, on your right hand side. When the road turns abruptly right, continue straight across the village green to cross over the Hosedon Burn via a small wooden footbridge. 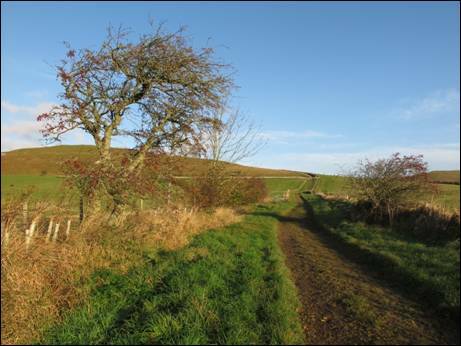 On joining the track on the opposite side, which is the route of the ancient Clennell Street, turn immediately left and begin your steady climb past The Creel, on your right, and Alwinton Farm, on your left. The track, initially surfaced, now becomes quite stony as the gradient moves up a gear and then, quickly eases as the view over to Silverton Hill opens up. Soon you will see a metal gate on your right alongside a small ladder stile and this is your way forward. So, cross over the stile and, leaving behind Clennell Street, head straight across a couple of grassy fields with a post and wire fence close to your right hand side. You will cross two small step stiles along the way. After crossing over the second stile you will spot a rather insignificant marker post straight ahead which marks the point where you need to turn left down a narrow path as far as a skinny beam and concrete footbridge across the River Alwin (GR NT928070). Now head to the other side and, on joining the gravel track, turn left across a cattle grid. 2. Through the trees on the right hand side of the track stands Clennell Hall, described by Nikolaus Pevsner in his highly regarded 1957-published book, `The Buildings of England Northumberland` as, mostly of 1895 in the Tudor style, but the east part a tower-house with segmentally vaulted ground floor, and to its west a wing of 1568 projected in front of the tower, two storeys high. It is now described by the owners as Clennell Hall Country House and provides overnight accommodation, food and drink as well as an adjacent caravan park. Continue along the red surfaced track keeping eyes and ears open for the occasional passing vehicle including an odd logging lorry or two heading to or returning fully loaded from the conifer harvesting operations in the vast Kidland Forest. 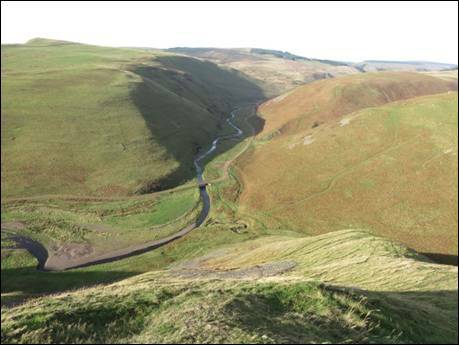 As you trundle upstream, the River Alwin your constant companion, you will cross over two bridges as well as passing, on your right hand side, the steep north western face of Clennell Hill, a hill you will climb on your return journey. Once you have crossed the second bridge and after a further 200 metres of walking along the track, you will reach a small watercourse on your right hand side running through a very narrow v-shaped valley (GR NT924084). 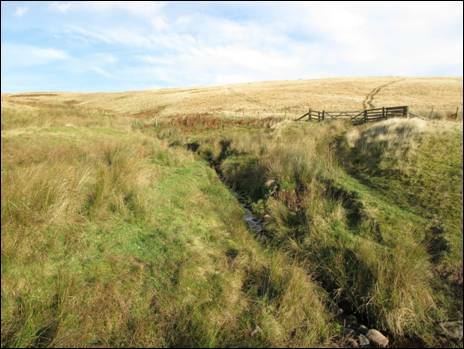 This is Puncherton Burn and, if you look half right, you will see a clear track running sharply up the facing slope. This is the start of your climb towards a very distant Wether Cairn, the highest point of your walk. Take a deep breath and commence your uphill journey, pausing at will to take in the pleasant view of the valley as it slowly recedes behind you. 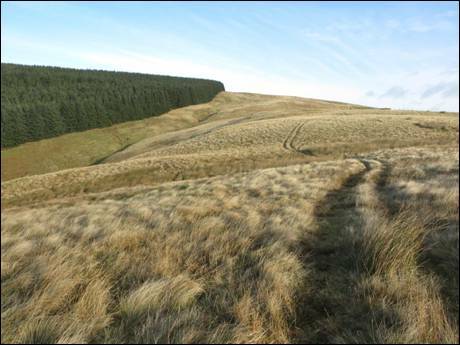 Keep with the clear quad track as it continues past a corrugated animal feed store and on over The Dodd, 332 metres high and the first of the seven tops of the day. Over to your right, surrounded by lush green pastures, lies the lonely farm of Puncherton the access track to which you will cross later on your walk, whilst over to the left stands the cluster of buildings known as Kidlandlee, once the site of an enormous shooting lodge belonging to Captain Leyland of Haggerston Castle, a rather extravagant building which was hopelessly out of place in such a wild and beautiful area. Currently, some of the remaining buildings are let as holiday accommodation. Stay with the quad track as it loops around the head of White Slack until you reach another corrugated animal feed store (GR NT925098). Take a breather, enjoy the view. 3. You are now close to the top of your next hill, the second of the day, so, with your lungs now suitably refilled, follow the rising quad track immediately after the feed store which will, in a very short distance, deliver you to two adjoining gates. Go through the right hand gate and, with the post and wire fence on your left hand side, head straight on to cross the unmarked 410 metre high grass-carpeted top of Puncherton Hill. Keep going as the fence heads slightly downhill and, when another fence is reached (GR NT932100), turn left through the metal gate and then immediately right through the second gate. The track ahead is clear. Continue with this track and when it splits in two make sure that you take the lower spur. Eventually, this will lead you to a barbed wire fence which appears to bar your way forward. Rather than attempt an heroic and potentially painful straddling of the fence, turn right for approximately 200 metres where you will find a convenient gap in the fence, two gate posts but no gate. Ahead stretches a vast rising expanse of mat grass which in June produces erect spikes, and, when autumn approaches, bleaches almost white. Hence, these areas of grasslands are called `whitelands` as opposed to the areas of heather which are often referred to as `blacklands`. Now keep with the track as it crosses an area of potentially boggy ground. Set your sights on the upper part of the dark coniferous edge of the clearly visible forest whilst also concentrating on keeping with the quad track and, in time, you will reach the north eastern corner of the Kidland Forest close to a wooden gate. Do not go through this gate, instead keep heading upwards alongside the fence and when a second gate is reached, go through (GR NT941114). 4. Take the track as it heads half right through swathes of heather to reach firstly, a fairly substantial shelter cairn and then, less than 100 metres further on, the triangulation pillar which marks the top of 563 metre high Wether Cairn (GR NT940116). This stands on a tiny raft of relatively short grass floating in a seemingly endless sea of deep heather. 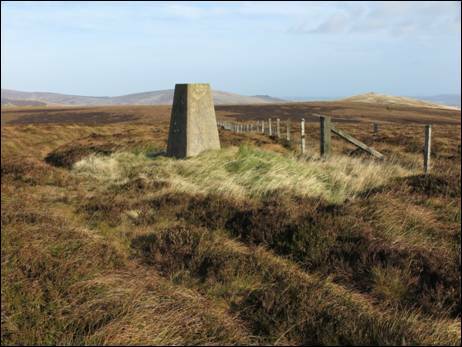 An examination of the current Ordnance Survey map of the area would seem to suggest that this pillar and the nearby shelter cairn, which was referred to on the 1866 1st edition Ordnance Survey map as a shepherds cairn stands on Wholhope Hill. However, the hill itself is now commonly referred to as Wether Cairn, a fact accepted by the Ordnance Survey. The view is extensive with Hogdon Law, Cunyan Crags, Dunmoor Hill, Hedgehope Hill, Shill Moor, The Cheviot, Cushat Law and Bloodybush Edge all easily identifiable if a tad distant. The triangulation pillar, which is classified as a secondary pillar, was completed on the 4th July 1954 and was last maintained by the Ordnance Survey in September 1978. The nearest pillar to this one lies 3.7 kilometres away on the summit of Shill Moor high above the Breamish Valley. This is a good spot to have a bite to eat although it is exposed to everything the weather can throw at it, not least a strong and decidedly nithering wind. You might prefer to eat your bait in the nearby shelter cairn. 5. Once you have finished your refuelling, head back past the shelter cairn towards the point where two fences meet. Here you will spot, over to your left, a small step stile on the opposite side of a small stretch of heather. Head for this stile, cross over and then continue straight on with a post and wire fence on your left hand side. Take great care as you cross over lumpy terrain always keeping a keen eye out for the occasional hazard in the form of a moss-covered bog. In a short, if slightly laborious, time you will reach a fence junction. Your route heads half right but, before continuing forward, you may wish to clamber over the fence you have just been following at the point where the two fences meet, and then wade through deep, springy heather for about 20 metres where you will find a small pool. This is one of a cluster of such pools in the vicinity and is, in a landscape of dark heather, a most welcome sight. On 17th February 1945 a Halifax bomber, returning to its base at RAF Tholthorpe in East Yorkshire from an aborted mission to Germany, crashed on Wether Cairn`s heather-covered slopes. The following day, the injured sole survivor of the seven man crew, the 21 year old rear gunner, was found, by a local shepherd, staggering around the hillside in thick mist and suffering from shock, badly twisted ankles and hypothermia. He was taken down the hill to the shepherd`s cottage at Puncherton and, after being treated by a doctor, he remained there for a few days before being taken by horse and cart to the nearest roadway, where an RAF ambulance met him. The on-board bombs were eventually exploded by the recovery crew creating large craters in which this cluster of pools subsequently formed. So, before you leave this spot, spare a thought for the young crew who lost their lives on this remote hillside all those years ago. Now continue your journey downhill over what is generally pathless and boggy terrain, passing another pool on the other side of the fence and choosing the line that suits you best whilst always keeping in visual contact with the fence on your left. The occasional and intermittent quad track indentations may help you along the way until you eventually reach the point where three small strands of the fledgling Biddlestone Burn converge. Over to the left you will see a five bar gate through which a Public Bridleway passes whilst, to your right up a small rise, stands a tumbled down circular sheep stell (GR NT944101), a common sight in Northumberland. 6. The way forward passes to the right of the sheep stell and continues uphill, bending ever so gently to the left as you make your way, not always on a clear path, along the route of the map marked Public Bridleway. You are heading towards a small step stile over the fence on your left and lying towards the top end of the slope. Once there, cross over and continue more or less straight ahead, the ground is initially pooled, following a slightly sunken track in the direction of the rising ground ahead. This is Gills Law, the fourth hill on your itinerary. When the track begins to level off near the top of the rise, turn diagonally right and make your way across the grassed-topped and unmarked summit of Gills Law from where there are fine far-reaching views (GR NT944095). Continue as far as the fence which you now must follow to your left until you join a red gravel track. To the right and through a five bar gate, this track leads to the isolated farm of Puncherton, seen as you made your way over the first hill of the day. Your journey continues in the opposite direction following the track until a marker post is reached on the left hand side of the track. This marks the Public Footpath which eventually reaches Biddlestone just less than 2 kilometres from here. You should now follow this footpath uphill until the gradient levels and then, after turning right, head across the unmarked and undistinguished top of Loundon Hill (GR NT945089). This is one simply for the record, a hill to make up the numbers. Keep walking across the top heading towards a metal gate a few hundred metres further along the track you have just been following. 7. Now go through the gate and continue along this fine track for approximately 250 metres to the point where the track begins to curve towards the left. On the right hand side of the track you will spot a tiny rocky outcrop and this is the spot where you will bid farewell to the track to begin your climb over, initially, pathless grassland to the summit of Silverton Hill. In simple terms, the easiest way to pick your way over relatively short grass is to aim for the highest point of the hill and, once you have obtained the ground which hugs the skyline slightly to your left, you will join a quad track across the shoulder of the hill. Keep with this track to the unmarked summit (GR NT931081), 385 metres above sea level and enjoying superb views across Coquetdale to the broody Simonside Hills. Now begin your descent towards your final top of the day by continuing forward turning slightly to your right as you gain sight of the small gate through the dry stone wall on the saddle before Clennell Hill. Enjoy the huge panorama as you go, as pretty a view as you can find hereabouts. Once on level ground go through the gate and keep heading across the highest ground, aided from time to time by a handy quad track. 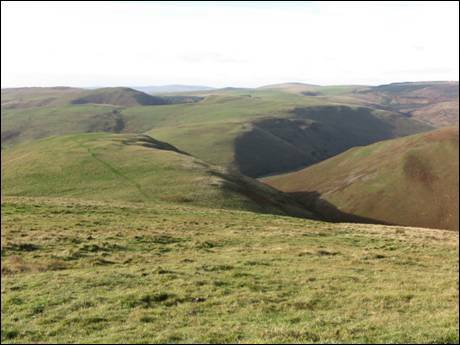 Along the way, you will cross the top of Clennell Hill, at a mere 322 metres in height the lowest of the seven tops you have crossed on this walk. 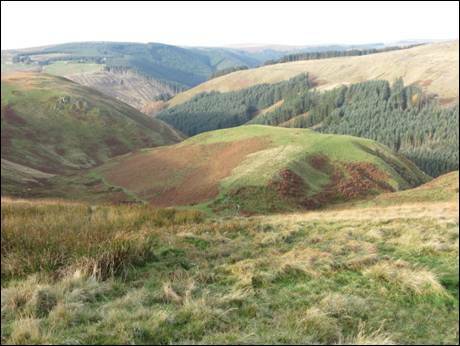 However, as you carefully wander along the north western edge of this fine hill, from right to left, the view down to the Alwin Valley is rather dizzying for such a small lump of ground. 8. 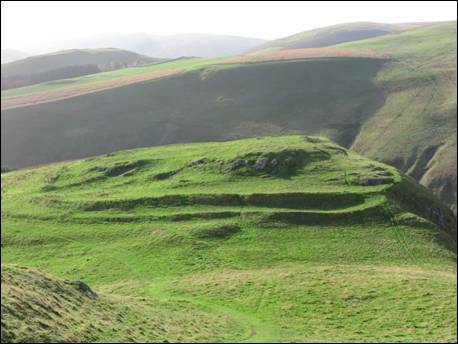 Once you have reached the southern end of the north western edge you will see below you Camp Knowe, a fine example of a hillfort and one which seems to stand guard over the southern end of the Alwin Valley. Whether this was the actual intention is, as local archaeologist Paul Frodsham discusses in his superb 2006-published book, `In the Valley of the Sacred Mountain`, open to some doubt. He points out that, whatever its purpose, it has, a continuous double rampart of earth and stone (except along it north-west side where only a single bank was constructed above the precipitous drop down to the Alwin). You will, no doubt, see for yourself as you wander downhill towards Camp Knowe (GR NT926078) Once there, clamber to the flat top to enjoy one final elevated viewpoint. Head straight across the top and start downhill on a clear path which relatively quickly reaches the red gravel track through the Alwin Valley. You will recognise it from your outward journey. Turn to your left, retracing your footsteps firstly, to the narrow beam and concrete footbridge over the river and then, after turning left on the opposite bank, walk uphill to the first of the two small step stiles encountered earlier in the day. Once you are back across the two fields, climb over the ladder stile, turn left onto Clennell Street and wander downhill towards a not-too-distant Alwinton and the end of the walk.